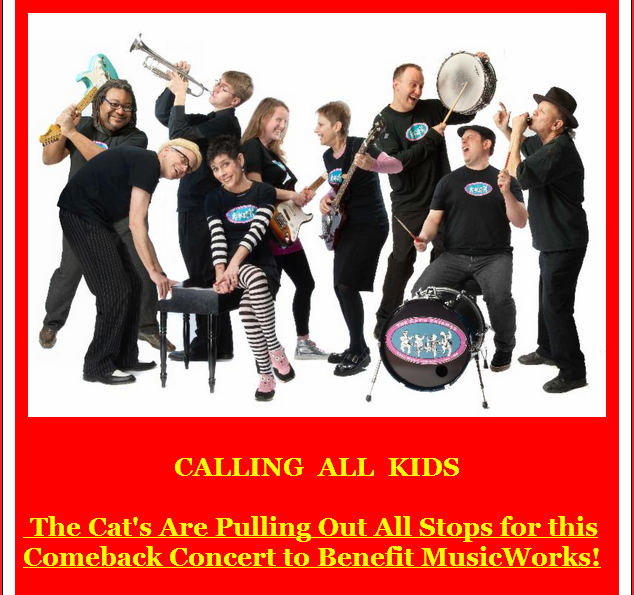 The Cat’s Are Pulling Out All Stops for this Comeback Concert to Benefit MusicWorks! The Cat’s will be putting on quite a show for this Comback Concert with a 7 piece band, in support of MusicWorks, a Havertown based nonprofit music therapy service provider working with children and young adults with autism, Down syndrome, cerebral palsy, developmental delays and genetic abnormalities. Treasured by thousands of families since 1995 and now winning over a second generation of fans, The Cat’s Pajamas is known for its multigenerational appeal and high-octane rock sound. Their show takes audiences to a wild, wonderful world of stories, dance and music, with the hottest rhythm and the coolest horn line in the business, signature four part harmonies and a bonafide family dance party. Tickets $10.00 for all ages.